I was a little apprehensive as I picked up ‘Train to Pakistan’ by Khushwant Singh, as I had read Burial at sea by the same author and was left disappointed with his sloppy treatment of a murder mystery. 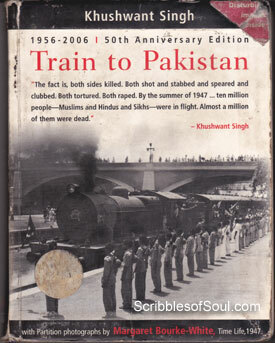 But, ‘Train to Pakistan’ is synonymous with the name of Khushwant Singh, and as it has always been touted as a bestseller, my curiosity over rode my apprehension, and I picked it up. And, I am glad that I followed my heart, as Train to Pakistan is indeed a good book, a novel that is a curious mix of love story and political satire, set against the background of partition, and has not lost its sheen even after 56 years of its conception. The story revolves around the innocent, worldly unwise villagers of Mano Majra, who are caught in the whirlwind of riots, spurred by partition of India. In the beginning, Mano Majrans have no idea as to what the creation of Pakistan or eviction of Britishers mean, till some people actually enter their village to avenge massacre of Hindus taking place on the other side of Sutlej. And, in a blink, people are up in arms without even knowing the purpose for which they are ready to sacrifice their blood ties. I liked Khushwant’s frankness in exposing the bureaucratic incompetence and the die hard foolishness on the part of common men, which had formed the basis of riots during the partition. It is quite true that whenever a political chaos or anarchy grips a country, its citizens indulge in slogan shouting, feverishly vow to punish the evil doers, without having any idea about the consequences or sanity of such mindless violence. The mob has just one character, it is unruly and desperate and such mentality probably engulfed the better sense during the mass exodus at the time of India’s Independence as well, where millions of people lost their lives and loved ones. In a way, there is nothing new or unknown in the theme. Partition has always been a favorite topic with authors. Be it the famous Difficult Daughters or little known The Long Walk Home, the massacre and numbing violence always cried out in the most piteous of voices in Indian Literature. However, it is the unusual treatment of the theme by Khushwant Singh, that gave the book a different hue. The novel has a very strong beginning, where three events – a cold blooded murder, a clandestine love meeting and an attempted moral violation occur at the same time, hidden beneath the shrouds of darkness, and would play a major role in instigation of communal hatred. The Hindu Bania Ramlal is murdered by Malli and his gang (dacoits of neighboring village and accomplice-turned-enemy of Jagga), but the sexually frustrated, alcohol influenced brain of Deputy Magistrate ensures that the simple case of robbery and murder, is metamorphosed into communal riots. To add fuel to the fire, a communist social worker, Iqbal is paraded as a Muslim Leaguer, out to mar the peace and harmony of Mano Majra. Jagga, the local goonda, who is in love with a Muslim girl, is imprisoned along with sombre Iqbal, while Malli, the actual murderer walks free, thus increasing the tension in Mano Majra. As trainloads of dead Hindus arrive in Mano Majra, to suffer a silent cremation, will Jagga or Iqbal be able to protect the Pakistan bound train to meet with the same ghastly fate, forms the basic premise of this emotionally charged story, stained with the blood of innocent humanity. And, it is to the credit of Khushwant Singh that he handled the horrible events of Partition very deftly. He presented the gory realities, without being too judgmental. Though, towards the end, I do not why, he chose to explain the atrocities in detail. That too, via a monologue of Deputy Magistrate, whose incompetence actually worsened the situation in Mano Majra. But, still, narrative was engaging, maintaining an aura of suspense and tension, almost throughout the novel. Though, I think, in an effort to write a meticulous English novel, Khushwant Singh resisted the usage of local slang and missed out on the chutzpah, a little use of vernacular words can bring into a narrative. Some words just don’t sound good in chaste English. A case in point is the usage of dry ‘Government’ instead of the endearing ‘Sarkar’ which was used by the courtesans, for their rich patrons. But, despite these minute irritants, I liked the novel, a lot more than my dismal expectations from the controversial author. However, I can not say the same about the present edition, a 50th Anniversary Edition, complete with partition photographs by Margaret Bourke White. Most of the photographs are too graphic, exhibiting half eaten dead people and skeletons littering the streets, or showing the poor, hungry, scantly clothed people with the most piteous expression, staring at the camera with a blank, ghostly look. These photos may have moved foreigners’ hearts at the time of partition and bring accolades for the photographer, but they thoroughly disgusted me, as I found them violating someone’s personal life, an impingement on their privacy at the most tragic time of their lives. I felt as if by looking at the most vulnerable moment of those mercilessly killed, left to be pecked by vultures, I was somehow denying them a proper funeral. The book would have been much better without these celebrated photos, as a tragedy is to be felt, not to be paraded naked in your face! In a nutshell, the story is good, characterization nice and narrative though choppy yet engaging. A worthy read!